Start shopping on Amazon Prime Now app with your Standard Chartered Credit Card to enjoy up to 10% cashback (capped at S$10/month) and enjoy free Amazon Prime membership.2 T&Cs apply. Get all the convenience of online shopping, without the wait. 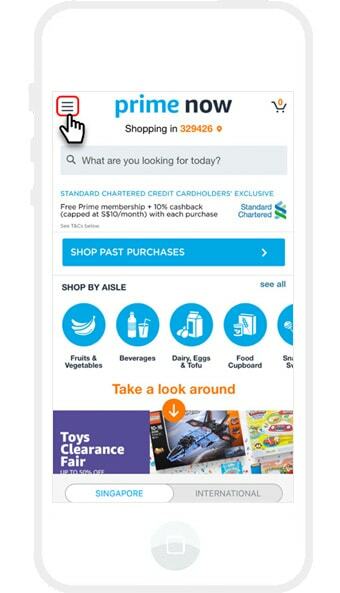 Start shopping on Amazon Prime Now app with your Standard Chartered Credit Card to enjoy up to 10% cashback (capped at S$10/month) and enjoy free Amazon Prime membership (worth S$2.99) when payment for the Eligible Cardholder’s Membership is made using an Eligible Cardholder’s card. No minimum spend required. The amount S$2.99 (equivalent to the price of a monthly Amazon Prime membership) and/or 10% cashback (capped at S$10/month) will be credited to the Eligible Cardholder’s card account(s) by the 28th day of the next calendar month. To illustrate, the rebate amount earned in August 2018 will be credited by 28 September 2018. 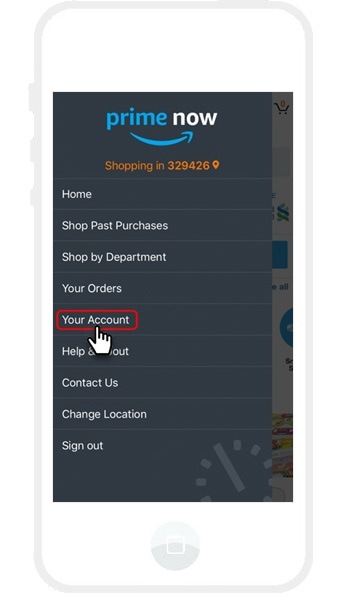 Access the Amazon Prime Now app and tap on the menu option on top left. Choose "our Account" option on the Menu. 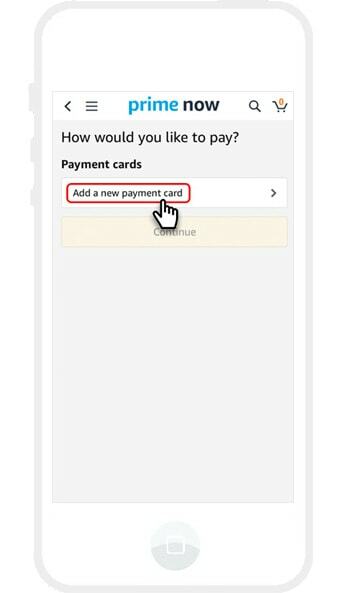 Click "Your Payment Methods" under Account Settings. Select "Add a new payment card" and add your Standard Chartered Credit Card as the default card. Already have another card on file? Add your Standard Chartered Credit Card and select it as the default option. From now to 31 October 2018, apply for the Unlimited Card and stand to win up to S$1,000 cashback with every minimum spend of S$100 in a single eligible transaction on your new card4. To receive S$150 in Prime Now Credits or up to S$100 cashback upon approval1 (only for new Standard Chartered credit cardholders), click on the relevant button below to apply for this credit card. T&Cs apply. Finance Charges Effective Interest Rate (“EIR”): 25.9% per annum (minimum). If payment is not made in full by the due date, finance charges will be calculated on a daily basis at 0.071% from the respective transaction dates for all transactions to the date the payment is received. Cash Advance Your cash advance fee per transaction is 6% on the Cash Advance, subject to a minimum fee of S$15 plus Finance Charges at 0.077% per day on the amount withdrawn from the date of the transaction until the date of full payment. Late Payment Charges A late payment charge of S$80 will be charged if minimum payment due is not received by the due date. The EIR applicable on your credit card and funds transfer account(s) will be adjusted to 28% per annum if the minimum payment due is not received by the due date). If you have only missed one payment, it will be reinstated to the prevailing EIR once minimum payment due is made in full. If however your account has been twice or more past due on a consecutive basis, the EIR will only revert to 25.9% once minimum payment due for the relevant consecutive months where your account was past due is made in full. 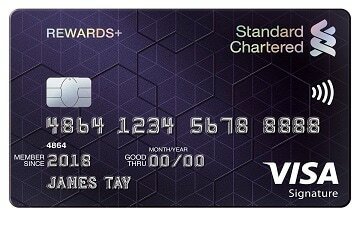 To be eligible for Credit Cards Sign-Up Promotion (“Promotion”) available from 1 September 2018 to 31 January 2019 (both dates inclusive) (the “Promotion Period”), you must (a) apply for one of the Eligible Cards (as defined below) issued by Standard Chartered Bank (Singapore) Limited (“Bank”); (b) be a new to Standard Chartered principal cardholder (i.e. do not have any existing/previously cancelled principal credit cards in the last 12 months with the Bank); and (c) activate the Eligible Card within the first 30 days of card approval. If you satisfy all the eligibility criteria (a) to (c) above, you will be eligible to receive a choice of one of the following: (i) S$100 cashback (“New CC Cashback”), subject to the Current and Previous Cashback Cap as defined in the full terms and conditions for this Promotion; or (ii) S$150 worth of promo codes for use on the Amazon Singapore Prime Now App (“Prime Now Credits”). 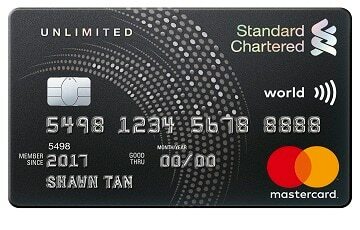 If you are existing to Standard Chartered principal cardholder and you satisfy all the eligibility criteria, you will be eligible to receive up to S$20 cashback (“Existing CC Cashback”); subject to the Current Cashback Cap and Previous Cashback Cap and will not be eligible to receive the Prime Now Credits. The New CC Cashback and Existing CC Cashback under this Promotion will be credited to your principal Eligible Card account within 30 working days of the date of activation of your Eligible Card. The Prime Now Credits under this Promotion will be issued to you in the form of three (3) promo codes worth S$50 each. Standard Chartered will send you the promo codes through a a redemption letter within 60 working days of the date of activation of your Eligible Card. 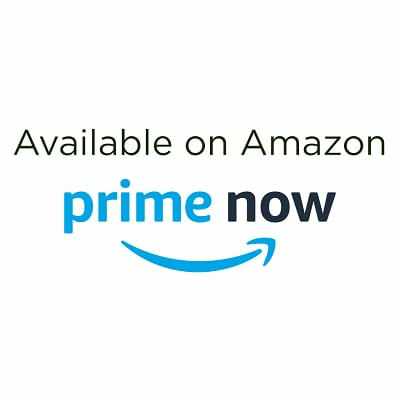 You are required to enter the promo code when you check out with your Singapore shopping cart on the Amazon Singapore Prime Now mobile app (“Prime Now App”) and make payment using your Eligible Card to claim the Prime Now Credits. Each promo code can only be redeemed once. Each promo code has a validity date as stated on the redemption letter and each promo code must be utilised before its expiry date. 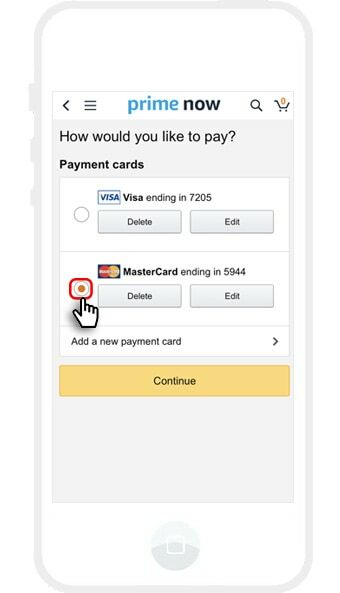 For the avoidance of doubt, if you are a new credit cardholder applying for more than one Eligible Cards within the same credit card application and have opted to receive Amazon Credits on the first credit card, you are not entitled to any cashback for the subsequent credit card(s) you apply within the same credit card application Visit sc.com/sg/signup-tnc for details and the full Credit Cards Sign-Up Promotion Terms and Conditions that apply. “Eligible Card” refers to Unlimited Cashback Credit Card, Rewards+ Credit Card, Platinum Visa/Mastercard® Credit Card, Spree Credit Card, NUS Alumni Platinum Credit Card, Prudential Platinum Credit Card and PruPrestige Visa Signature Credit Card. The Standard Chartered and Amazon Prime Now 2018/2019 Promotion (“Promotion”) is available from 6 August 2018 to 31 January 2019 (both dates inclusive) (the “Promotion Period”) and is valid for eligible credit cards issued by Standard Chartered Bank (Singapore) Limited. An Eligible Cardholder can earn (a) a free Amazon Prime membership (“Membership”) worth S$2.99 per calendar month when you make payment for your Membership with an Eligible Cardholder’s card and/or (b) up to 10% cashback (“Cashback”) on the Eligible Cardholder’s Singapore and International shopping cart transactions capped at S$10 per calendar month, made on the Amazon Singapore Prime Now mobile app (“Prime Now App”). The Cashback will be credited into the eligible Cardholders’ Card account(s) by the 28th day of the next calendar month. The maximum 10% Cashback an Eligible Cardholder can earn is capped at S$10 per calendar month. 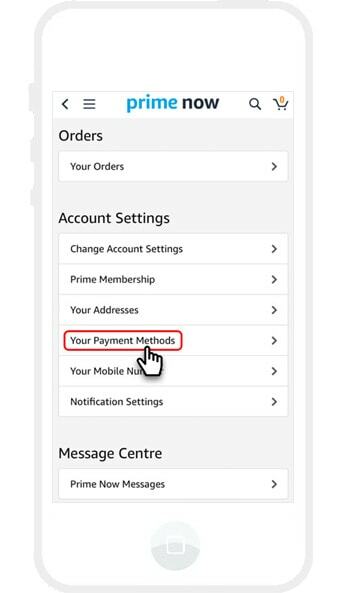 Each Eligible Cardholder regardless of the number of principal or supplementary credit cards or memberships he/she may hold, is entitled to the cashback of S$2.99 for one Amazon Prime membership. For the avoidance of doubt, the maximum Cashback of S$10 an Eligible Cardholder can earn in a calendar month excludes the amount S$2.99 which is credited into the Eligible Cardholder’s Card through Cashback for the free Membership. This is regardless of how many Cards he/she uses or how many Prime Now App transactions he/she makes. 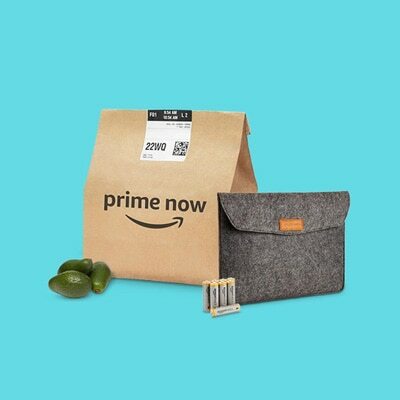 The Standard Chartered and Amazon Prime Now 2018/2019 Promotion Terms and Conditions apply. Click here for the full terms and conditions that apply. The Unlimited Cashback Credit Card Pinball Game Promotion (“Promotion”) is available from 15 August to 30 November 2018 (both dates inclusive) (the “Promotion Period”). The Promotion is only open to new principle cardholders of the Unlimited Cashback Credit Card (“Eligible Card”) issued by Standard Chartered Bank (Singapore) Limited (“Bank”) during the Promotion Period (collectively, “Eligible Cardholders”). Cardholder who has previously cancelled the Unlimited Cashback Credit Card in the last 3 months and reapply as a new Unlimited Cashback Credit Cardholder during the Promotion Period will not be eligible for this Promotion. To qualify for the Promotion, Eligible Cardholders and/or their supplementary cardholders, must during the Promotion Period, charge a single eligible retail purchase of S$100 or more to the Eligible Card (“Qualifying Transaction”) at least 7 working days after the date of card activation. This Promotion is limited to the first 15,001 Qualifying Transactions (each a “Winning Transaction”) and an SMS containing a unique URL will be sent to the Eligible Cardholder’s registered mobile number with the Bank for the Eligible Cardholder to play a pinball game. Upon completing the game, the prize of a cashback of up to S$1,000 or a trip for 2 to New York City (“Prize”) which the Eligible Cardholder has won will be displayed on the mobile phone screen. The Promotion is subject to the availability of the Prizes. The availability of the New York Trip will be updated on sc.com/sg/unlimited and Eligible Cardholders have the responsibility to check on the availability of the New York Trip prize prior to participation. An SMS or Notification Letter will be sent to the Eligible Cardholders on the fulfilment of the Prizes by 31 December 2018. Transactions such as, but not limited to, insurance premiums, all modes of bills, payment via AXS and SAM networks, payment to government agencies, income tax payments, EZ-Link/TransitLink top-up/reload, any transactions pertaining to selected Merchant Category Codes, Credit Card Funds Transfers, cash advances, NETS purchases, ongoing instalment payments, any fee and charges, cancelled and reversed transactions and outstanding balances will not be considered as a Qualifying Transaction for purposes of the Promotion. Visit sc.com/sg/pinballgame-tnc for details and the full Unlimited Cashback Credit Card Pinball Game Promotion Terms and Conditions that apply.